Entries for the Core77 Design Awards close on 8 March 2018. From traditional to progressive, the awards jury will honour practitioners within 14 areas of design enterprise at both the student and professional levels. The Core77 Design Awards offers a unique look into the jurying process, which often goes unseen by the public. The jury will be posting individual announcement videos where each jury member describes the process, observations and discourse that led to them choosing the category award winners. In addition to the standard categories, there are also a number of progressive design categories. The categories are as follows: Built Environment; Commercial Equipment; Consumer Product; Design Concept; Design Education Initiative; Design for Social Impact; Furniture & Lighting; Interaction; Open Design; Packaging; Service Design; Strategy & Research; Transportation; and Visual Communication. To enter the awards, your project must have been completed between 1 January 2017 and 31 December 2017. For Professional work, this means that your project was launched on the market, produced and released to the public or made available for pre-order to the public. To enter, you will need to submit an entry form, complete the full description, upload all the assets and pay an entry fee for each project that you enter. 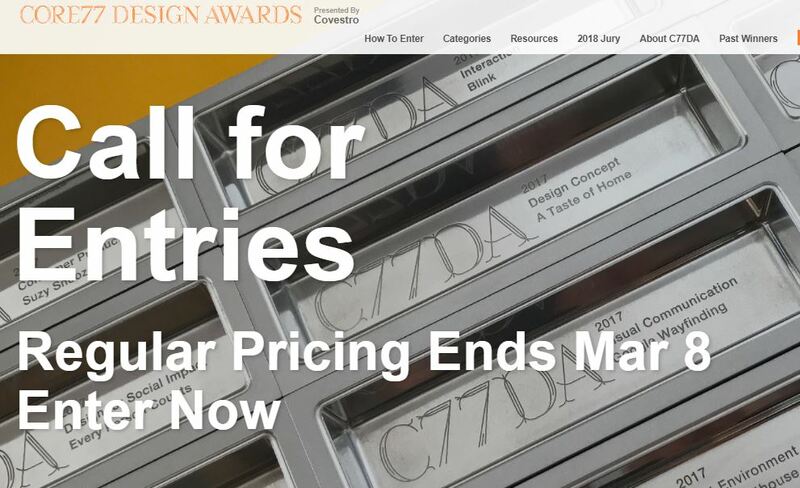 If you are unsure about which categories are appropriate for your project, you can contact the Core77 Design Awards for guidance. For more information, visit http://designawards.core77.com.